Doctoroff, Tom. 2012. What Chinese Want: Culture, Communism, and China’s Modern Consumer. New York: Palgrave Macmillan. This may be true for the emerging middle class, but what about the millions who are happy to have consumer goods, period. For them, the cheapest brand will do. I know many faculty members at Chinese universities that would strongly disagree with this, especially those in the humanities. Again, he is overgeneralizing. A rather pessimistic viewpoint. China has progressed in practically every area of society in the past 30 years. I see no reason to believe that things won’t continue to change and improve. Again, this is debatable. I have not met too many Chinese that are enamored by Western individualism. Most find it rather odd. Despite Doctoroff’s tendency to overgeneralize, and his frequent repetition, he is not afraid to challenge the reader; he makes you think, ask questions. Some of what he says may even anger you, especially if you are native Chinese. All of this is okay. I like someone with an opinion even if I don’t agree with it. The best books are those that challenge you. 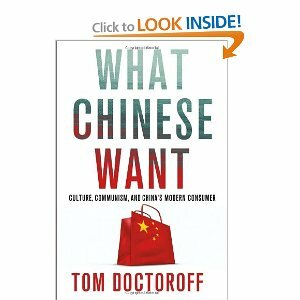 In sum, this book provides a nice look into Chinese consumer culture. The reader comes away with a better understanding of the dramatic changes in society in China today. I recommend it, especially for those interested in advertising and marketing and want to understand what’s going on in China.